About Us – Northwind Composites, L.L.C. Northwind Composites L.L.C. was founded in May 2011 when its President, Lee Skidmore, realized he could provide unique products to the outdoor recreation and racing world he loves through a proper mix of proven manufacturing practices and aerospace design philosophies. Lee graduated in 2006 with a B.S. in Aerospace Engineering from Virginia Tech. Since then, he has spent several years as a program manager for an advanced aerospace composites manufacturer producing parts for Boeing, NASA, IDS, Sikorsky, and more. After spending a couple years in the world of composite manufacturing, he took a job in 2009 with a turbine aircraft OEM as a design engineer. There he continues to support their composite component design needs as well as structures, powerplant, and systems. When Lee is not working his engineering day job or at the shop, he can be found enjoying his many hobbies with his loving wife. 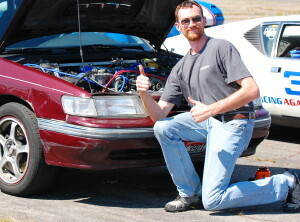 He is very active in the regional Auto-X club, racing in Street Mod since 2007. While with the club, he has been both Safety Officer and President until stepping down into a support role a couple years ago. Additionally, Lee is an avid outdoorsman who enjoys backpacking, mountaineering, kayaking, fishing, canyoneering, and recently has taken up sailing. He is often quoted as saying “How hard can it be?” Despite the sometimes obvious answer, he will pursue the goal until the right solution is found. He firmly believes that nothing is unattainable and life is meant to be lived – not worked. It is these values that drive him to ensure Northwind Composites is producing a product that lets its customers enjoy the most out of their passions and lifestyles.